“Our tagline, ‘bikes we share’, really reflects the community-based nature of the program,” says Mia Kohout, general manager at Vancouver Bike Share Inc. (a subsidiary of CycleHop), the firm contracted by the City of Vancouver to operate the program. “It’s about sharing bikes, sharing the space, and sharing our city,” she adds. Both The City and Vancouver Bike Share Inc. are working to finalize preparations for bike share to launch this summer, which includes identifying the best locations for public bike share stations to help fill the gaps in the active transportation network. A total of 1,500 bikes at 150 stations will be available by the end of summer 2016. The initial service area will include the Downtown Peninsula, bounded by Arbutus Street, 16th Avenue, and Main Street. Founding memberships are now on sale for $99 or $129 for one year depending on the plan chosen, reflecting deep discounts of close to half price, only available until June 30, Kohout says. "People who buy founding memberships will get the best deal and have the flexibility to grab a Mobi whenever they need one," she adds. 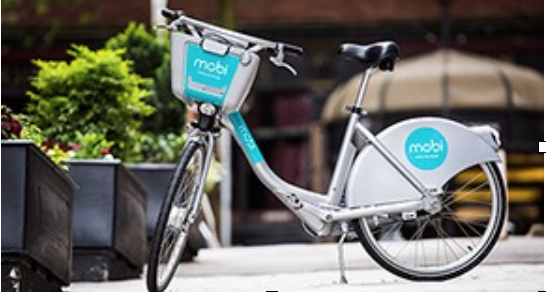 Vancouver’s Mobi bikes are “Smart Bikes” and can be activated and unlocked from a docking station through an interface on the bike or through a payment kiosk, making them an easy and convenient option for short trips. Helmets will be available on bikes at no additional cost.